Fifteen men have been trapped inside a so-called rat-hole mine in India's north-eastern state of Meghalaya since 13 December. Priyanka Borpujari spoke to a miner who left his job at the same mine days before the accident because he found it to be too dangerous. Abdul Alim believes if he had stayed, the job would have killed him. Two cousins, Omor and Shirapat Ali, are among the 15 miners who have been trapped for three weeks. Abdul, who fears they may be dead by now, stutters every time he speaks about them. Flooding blocked their exit from the rat-hole mine - named for the narrow crevices through which coal is extracted. Efforts to rescue them have made little headway - a fact that does not surprise Abdul. "Once we went down, there was hardly any light streaming in from above," he recalls. "The mines I had worked in earlier were only about 30 ft (9 metres) deep. But this was far more dangerous." It was nearly 400 ft deep. Abdul is 25 years old. He lives in a bamboo and mud house with his wife, Anjura, in a village called Magurmari on the the western edge of Meghalaya. Parts of the hilly state are home to deposits of coal, which is extracted through deep narrow holes after first digging pits. The mines are so narrow that several agencies involved in the rescue efforts have struggled to find a way inside. After several attempts, navy divers reached the bottom of the mine on Monday. But they returned saying they did not see any of the men and that rescue could only be attempted after all the water was pumped out. Rat-hole mining was banned in 2014. But it's still widely practised across the state, especially in the East Jaintia Hills where the men are trapped. These mines are privately owned and it is not clear how many exist. India is the world's third largest coal-producing nation and coal provides 60% of the country's energy needs. But the industry is poorly regulated. In early December, Abdul got into a taxi with his cousins and drove for 16 hours to reach Ksan, where the mine is located. 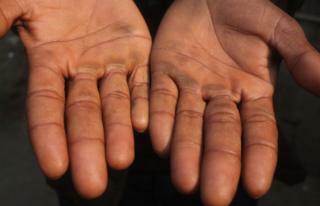 Abdul first started working in coal mines about two years ago. Before that, he worked as a mason and earned a daily wage of 400 rupees ($6; £4.50). But as a worker in the rat-hole mines, he was paid up to 30,000 rupees every month, partly reflecting the dangerous working conditions. Abdul says about 8-10 men would hop into a metal container suspended by a crane that would then be lowered into the mining pit. "Once we touched ground, the mines spread out in different directions. Each of us would crawl into one and go as far as 30 ft," he said. At this point, he gets off the bed he is sitting on and bends down to explain. "The mine would be this high, about two feet," he says holding his hand that high. "Our sardaar (leader) would instruct us about where to dig. We lie on our sides and chip the coal with the gaaithi (pickaxe). I would put my pushcart just under my legs, so that the coal would fall into it. Once it fills up, I would drag it and bring it to the central assembly point." A small torch tied into place behind his ear provided the only light available. Abdul says a supervisor kept track of the number of workers and how often each one of them returned with a cart full of coal. This determined their wages. He would work four hours straight before taking a break. He often began work at 5am and kept working until noon. During winter, he says he preferred the warmth inside the mine to the biting cold outside. When I ask if crawling and lying on his side for such long hours affected his body, his wife, Anjura, answered. "The skin on his back has gone hard and black like leather," she says. But Abdul says: "Only my right side. Because I would lie on that side and work." Usually, there are up to 200 men working shifts in a single rat hole mine. But Abdul says that the mine in Ksan faced a shortage of workers in December because many of them were from the neighbouring state of Assam. Most of Meghalaya's illegal miners are migrant labourers who come to earn better wages, but many of them went home to Assam to vote in local elections in the first week of December. And the ones who were left behind took on more shifts. Meanwhile, Abdul who had lasted a week in the mine started to look for a way out. The work was the same as the other rat hole mines he had worked in before. But the sheer depth of this one, he says, petrified him. And it drove him home. He told his cousins he wanted to leave but they wouldn't let him, reminding him of how much he was getting paid. "So, one afternoon, after lunch, I told my cousins that I needed to buy a belt for myself. I went to the nearest market, bought the belt and got onto the first bus I saw, and finally made it home," he said, lifting his shirt to show the brown belt. He says he actually needed the belt. Returning to the accident, Abdul says it's possible that water from a nearby waterfall gushed into an adjacent mine. "A hole in the mine where I worked intersected with a hole in the adjoining mine and water from there probably rushed in," he says. "The supervisor warned us not to dig in that direction but some of them did not listen to him." Officials blame this and water from a nearby river. He adds that by the time a miner hears the water coming, it's too late to escape. He doesn't think it's likely that the men in the mine can be saved. "To get all the water out, they would need to pump out 15 neighbouring mines simultaneously," he said. Officials have started pumping water out but say the operation will take time. Abdul left three days before the accident that has cast gloom over Magurmari: seven men from the village are trapped in the mine. He left with only his ID, abandoning clothes as well as seven days' wages. "I don't care for the money I left. I needed to save my life."